Welcome! E Komo Mai ! Maui Diving Scuba & Snorkel Center is a woman-owned small business. We take pride in planning your water activities to suit your needs! We offer all levels of Scuba Diving on Maui, from the beginner level discover dives up to Instructor. At Maui Diving you can, scuba dive the island of Lanai’i, Molokini, and many more dive sites on Maui! We are your full service PADI 5-Star dive center for Scuba certification, equipment rental, repair, & sales, daily snorkel and dive boat trips as well as guided beach dives on Maui! Recently renovated, Maui Diving is the largest dive shop on Maui. We’ve got the freshest shop and the largest selection of diving gear, masks, fins, etc to choose from. Maui Diving Scuba Center has the best safety record of all scuba diving operators on Maui! Why? Our instructors are the most concerned about your safety, and they want to make sure that you return every year for more fun than you ever had in your life. Whether you are an experienced SCUBA diver or have never tried it, we have what you need, at the best prices on Maui! 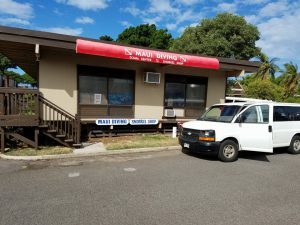 Maui Diving Scuba & Snorkel Center will provide you with Shore Dives, Boat Dives and Snorkel Trips to all the top dive sites. We have THE BEST and MOST EXPERIENCED INSTRUCTORS ON THE ISLAND! Maui Diving has more years of experience than anyone on Maui and We certify more divers than any dive company in Hawaii! We are the ONLY SCUBAPRO and Aqua Lung dealer in Lahaina. We feel strongly that it is important for you as the consumer to have choices! Brands we carry: Scubapro, Aqua Lung, TUSA, Deep See, Sea Sports, SeaFear Apparel, PRAWNO Apparel, Watershot, Kraken Sports, GoPro, Stream2Sea, Big Blue by Roland St. John, Trident, US Divers, & Archon Dive Lights. About the Owner: Jessica Pickering purchased Maui Diving July 2017 after the original owner of 28 years decided to retire to another tropical paradise called Florida. Jessica spent her time traveling the world and scuba diving while simultaneously working on the marketing and graphic design business she owned, Creative Soup, since she was 18 years old. On one of these adventures in Fiji she met her husband Steven and they started a life together in San Diego. San Diego was a bit too cold for that island boy, so she went searching for a place that would still feel like home for him and not be too far away from family in California. While looking on the PADI classifieds for instructor jobs for Steven, she found a “Dive Shop For Sale” listing and called the number in the classifieds. Two months later she had moved to Maui, and 6 weeks after that the shop was hers. “Its been a whirlwind of life getting to this point, but I know that this is where we’re meant to be. Things have fallen in place and the business is flourishing with the new ideas and attention to detail I’ve brought with me”, says Jessica.